The Reserve Bank today left the Official Cash Rate (OCR) unchanged at 2.5 percent. And…“Although we expect to keep the OCR unchanged in 2013, OCR increases will likely be required next year.” A nod to increasing floating interest rates..
Well, there has been a flurry of emailed updates from the major lenders over the past 6 weeks.. Among the changes are new Low Equity Premium fee’s, separate sets of interest rates for over 80% lending, and fee discounts that might once have been available are all but gone for the over 80% borrower. These additional costs are adding up. 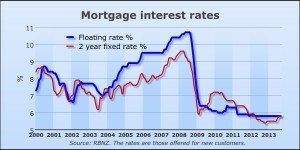 As an example, ANZ is applying a 0.5% margin on interest rates over 80%. On borrowing of $550,000 that’s an additional $2,750 p.a. Borrow between 85% and 90% with Westpac and the Low Equity Margin is 1.15%. On borrowing of $550,000 that’s an additional $6,325 p.a.